Prefer Bourbon or Whisky For Your Sour? 1 oz bourbon…. Why bourbon? Because it tastes better! Garnish with whatever you like but traditionally it is with a lemon wedge and a maraschino cherry. Boston Sour – same as above but shake with an egg white and ice. Ward 8 – same as above but add orange juice and grenadine. I’m not knocking the whisky. I’ve had a few sours in my day and loved them! Then, one kind bartender made one for me with Bourbon. I’ll never go back to whisky now! As a quick reminder, whisky could be made from various grains such as wheat, rye, maize or barley and is aged in charred white oak barrels. Elliot Stubb claims to have invented the Whisky sour in 1872. But let’s back up 2 years. 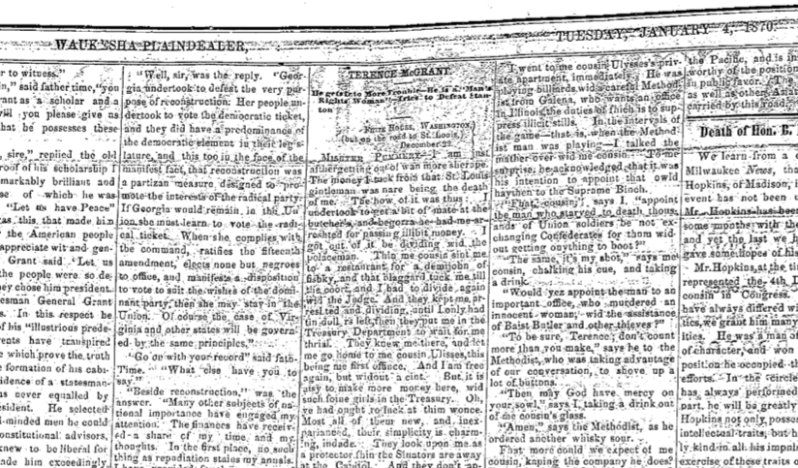 In the weekly Waukesha, Wisconsin newspaper, Waukesha Plaindealer, on Tuesday, January 4, 1870, there is an article written by Terence McGrant (Irish cousin to former President Ulysses S. Grant) who makes a reference to this cocktail: “Amen,” says the Methodist, as he ordered another whisky sour. (In the link above, 4th column from left, near the bottom). Back it up even further, to 1862, when Jerry Thomas published The Bartender’s Guide. His Whisky Cocktail is strangely close to what we know as a whisky sour today. Enter “50” in the page number box to find it. In the same fashion as the rum rations of the 17th Century, whisky would have substituted rum since it was more readily available. Otherwise, you had to wait for the rum to arrive. Surely, that wasn’t happening! To the rye, the juice from a lemon or lime would be added. Since the real origins could be anywhere in the world, and since I couldn’t find any older concrete evidence other than Terence McGrant’s article, let’s go with Wisconsin! Not too far from Waukesha is the city of festivals, in Milwaukee, Wisconsin. There’s always something going on. Today on Whisky Sour Day, there is a Mexican Fiesta running for the next 2 days. Don’t miss the tequila tasting. Ahem, a little off topic but worthwhile just the same. Take your pick of distilleries scattered throughout Wisconsin, with 3 of them in Milwaukee, to include on your next visit. They’re on my list! Find someone to concoct your whisky sour today or whip one up at home. It’s so easy. Check your freezer section for frozen concentrated limeade, even lemonade, and make a pitcher of it to share with friends. It’s Friday after all! Experiment with the lemons and limes to find out how you like it best. What’s your preference, whisky or bourbon? Posted by Kim Ratcliffe-Doe on August 25, 2017. What your cocktail will look like shaken with an egg white. Next Next post: Want The Bottom Line on Red Wine? Here’s 10!